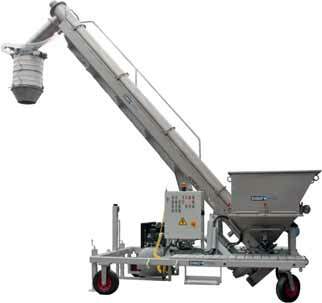 The Dino bulk truck loader from Van Beek is used worldwide for loading bulk goods efficiently. The Dino® loads bulk goods that are packed in big bags, and even shovelled loose bulk goods are no problem. The basic capacity is 40m3 hour (or 80m3 per hour) and the turnkey machine fully meets CE standards, Health & Safety (ARBO) legislation,ARAB,TUV etc. In short the bulk truck loader is not only an investment that gives a clear time saving, but worker safety is also substantially improved. The bulk truck loader looks like a standardized device, but that is just an illusion. The great strength of Van Beek is precisely that every machine is made to customer specifications. Van Beek is a specialist in screw conveyor systems and preferred supplier for many international organizations such as BASF, Nestlé, Callebaut, Heidelberg Cement Group, Nillezen, Halliburton and Ravago. However, the Dino is also very popular on the internet. At present, two American projects are under way. Last year,Van Beek supplied a (cement) Dino to a customer in Curaçao and two Dinos were shipped to Abu Dhabi. Early this year,Van Beek’s mechanic serviced existing Dinos in Korea and Spain. So Van Beek Dinos can be found all over the world. To continue to serve customers, the Van Beek sales engineers are available for new questions from the market. Since Van Beek develops and produces everything itself in house, this enables innovations to be integrated in the existing design. For example a Dino was recently designed for a French customer with a special pneumatic docking unit to connect the Dino to the bulk truck.